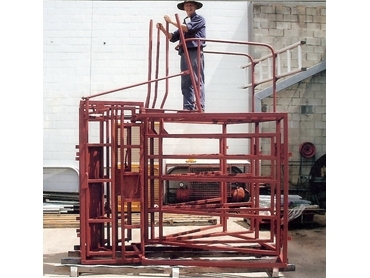 Quality Steel Fabrications & Engineering has been fabricating cattle handling equipment for 25 years. At the Richmond workshop (Central North Qld. ), the staff have worked alongside cattle producers developing equipment to suit their requirements. Cattle handling equipment, such as the 5 way draft and 3 way draft with the self catching head bail reduces the amount of personal needed to separate the animals, keeps stockmen and women out of the pens the animals are in. The draft also means the job of separating the animals into appropriate areas is a fast, safe way to shunt cattle to holding pens. The self catching head bail keeps the personal away from the side of the crush and or race, reducing the stress on the animal. The draft has a gate on both sides so the farmer can access the animals head for ear tagging, deworming etc. The draft has a working platform on top or Quality Steel Fabrications & Engineering can also provide a side platform. By building a curved race leading up to the draft, the farmer can see which animal is coming through the race, while theyare 5 to 6 metres away from the draft. This should also reduce the stress on animals.